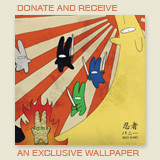 I’m sure you’ll have noticed an absence of Ninja Bunny in the new year. 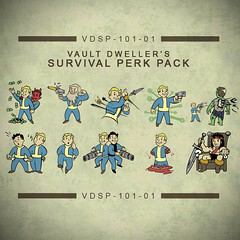 I’ve spent January on some other projects so I thought I’d just fill you in on what I’ve been up to, one of which has been a mod for Fallout 3 called the Vault Dweller’s Survival Perk Pack. The mod includes 10 new perks, each one has had a new icon drawn by myself (mostly based on Fallout 1/2 icons). It’s been a nice change doing vector graphics instead of hand drawings. Click the image to see the rest of the images on Flickr. It’s received some great feedback, being blogged about by Bethesda (the games company behind Fallout) and making the Nexus top 50 mods list. You can download the mod for PC from the Fallout 3 Nexus website. Oh, and don’t worry, Ninja Bunny will be back to it’s regular Monday and Friday updates soon.